You may receive updates from United We Dream, the sponsor of this petition. Trump made clear he will try to rule through race-based intimidation. It is time to declare America’s cities as sanctuaries of safety and not allow local police to do the work of immigration agents. If your city is not already, declare it a new sanctuary of safety for immigrants, Muslims, black people, and members of the LGBTQ community. 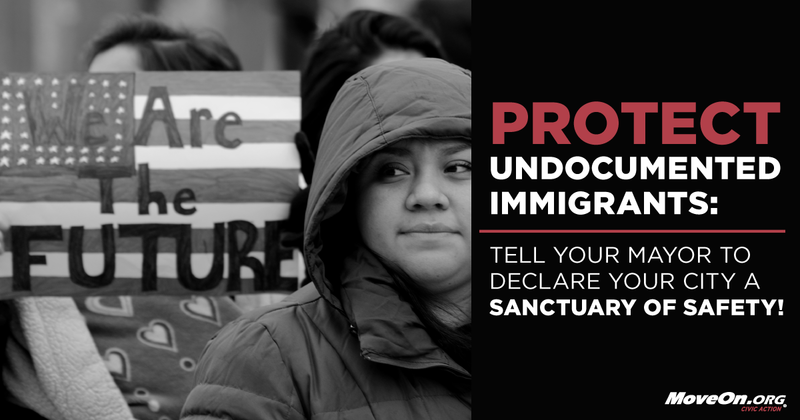 And if it is, commit to do everything in your power to maintain your sanctuary status and protect your undocumented residents from a Trump administration. It is up to us to ensure that millions of people are protected from the divisive politics of Trump and to reject the policy proposals that seek to spread fear into marginalized communities. Mayors across the country must stand with their undocumented immigrant residents in this moment of crisis. Undocumented Immigrants like me are under attack: Donald Trump has already said that in the first 100 days of office he would cancel DACA, a program that provides undocumented youth with work permits and protection from deportation, and begin deporting 2 million undocumented immigrants. But we can change this if we pressure mayors to declare their cities as sanctuaries of safety. In a sanctuary city, officials implement policies to restrict local police from turning immigrants over to federal immigration agents and declare in no uncertain terms that immigrants are welcome. Without them, undocumented immigrants like me and my family are left vulnerable to racial profiling, detention and deportation. We salute the mayors of cities like Seattle, San Jose, San Francisco, and Oakland who have been quick to stand with their undocumented residents. Undocumented Immigrants like me are under attack: Donald Trump has already said that in the first 100 days of office he would cancel DACA, a program that provides undocumented youth with work permits and protection from deportation and begin deporting 2 million undocumented immigrants. But we can change this if we pressure mayors to declare their cities as sanctuaries of safety.